Double Needle Lockstitch Machine in the market. These are manufactured from best quality material at state of art infrastructure unit. Application: Light & Medium Material. Motor: 250W Clutch type with the reversible plug-in mechanism. Maximum Stitch length: 0-4mm approx. Presser Foot Lifting: 7-13mm approx. Maximum Sewing Speed: 4000 SMP approx. Stand & Table: Standard Table with Adjustable height Stand. 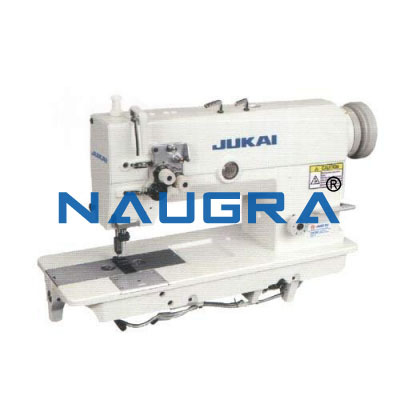 We are leading manufacturers, suppliers & exporters of Double Needle Lockstitch Machine. Contact us to get high quality designed Double Needle Lockstitch Machine for schools, colleges, universities, research labs, laboratories and various industries. We accept bulk orders for government tenders in all countries around the globe. For similar products visit at main page of Textile Engineering Lab Machines & Instruments.